Taverley (also spelled "Taverly") Dungeon is big and a good place for training, and there is also a bank close by in southwestern Taverley! Taverley is the village that the dungeon is named after, and it's the closest one you'll find. This dungeon is also called the "Members Dungeon" because it's the first one that many players enter once they become Members. Here is the outside city and closest city to the dungeon. 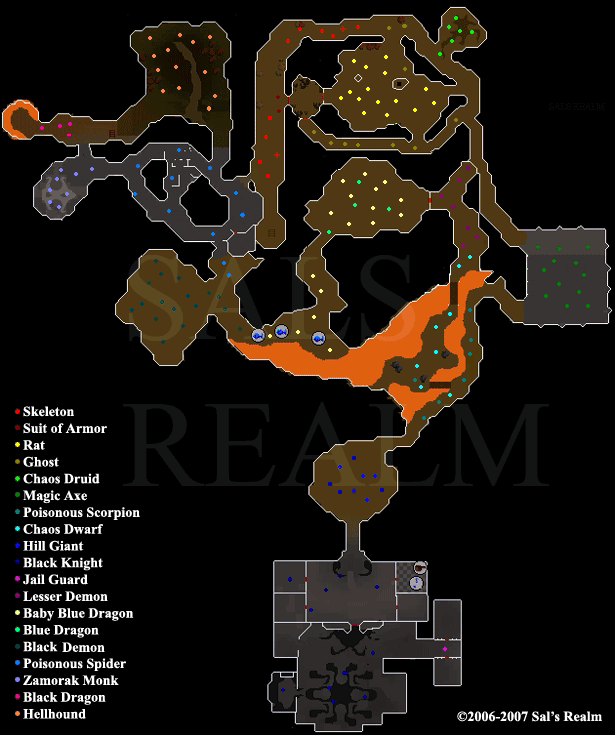 The red circle is the dungeon entrance. 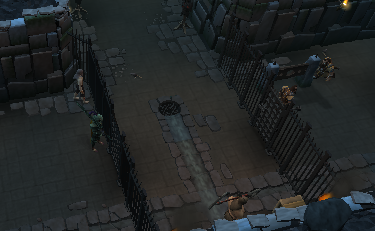 When you climb down the stairs and enter the dungeon you will come across two Agility shortcuts. 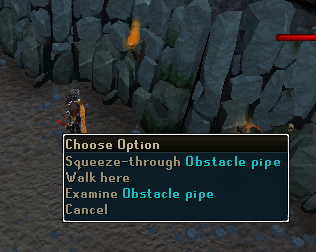 The first (to your East) is a pipe that requires 70 Agility to crawl through and leads you to the Blue Dragons. 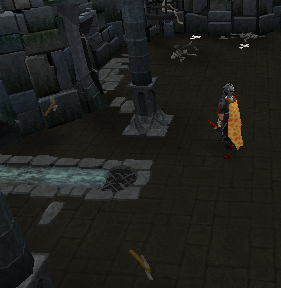 The second shortcut is slightly further on and requires 80 Agility. 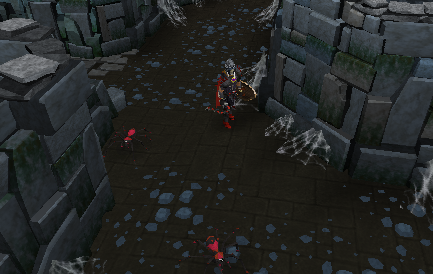 This leads to the Poison Spiders. 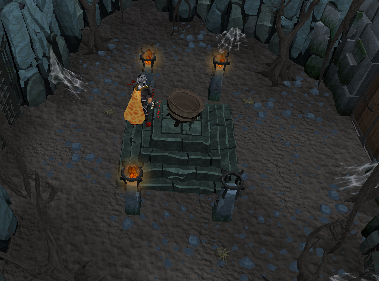 This cauldron once played an important part in the Druidic Ritual Quest. Players used to have to get past a level 19 animated suit of armour to get here. However, the quest was changed and the cauldron no longer plays any role. Past here there are two gates that you could go through. One to the East and one the the South. Through the Eastern one is a room full of Bats and through the southern one are Ghosts. If you didn't choose to go through the gate to the Cauldron of Thunder further to the north, you will come to some Chaos Druids. They are level 46 and are often killed for the Herbs they drop, so the area that they live in is often busy. If you go South from here you will go past some Black Knights and through a room full of Magic Axes. 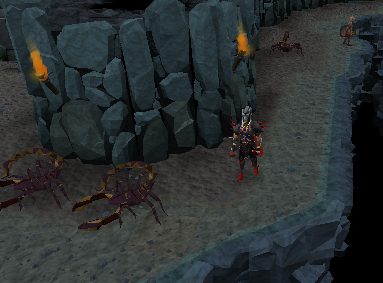 Through this room are some level 70 Poisonous Scorpions and some Chaos Dwarves. Also in the area is Ikadia the Exile, who plays a role in Birthright of the Dwarves. If you carry on South past the Chaos Dwarves you will pass some Hill Giants which are killed for the Big Bones that they drop and come to a room full of Black Knights. You may want to kill Black Knights to get your White Knight Ranking up. On the East side of this room is a Jail Cell. To enter you must kill the guard outside, take the key he drops and use it with the door. Once inside you can talk to the Explorer who is locked inside and get a Dusty Key which is required for access to the deeper parts of the dungeon if you don't have 70 Agility or more. If rather than going south to the Hill Giants you chose to go across the bridge and head North you will come to some Lesser Demons. 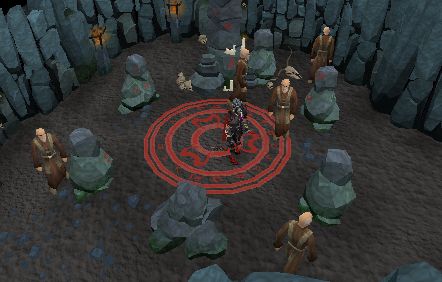 On the West side of the area that the Demons are enclosed in is a gate. To pass through this you must use your Dusty Key on it. Through the gate is a room full of Blue Dragons, Baby Blue Dragons and Blue Dragon Scales. It is recommended to be wearing an Anti-Dragonfire Shield or Dragonfire shield in this room to protect from the breath from the mother Dragons. 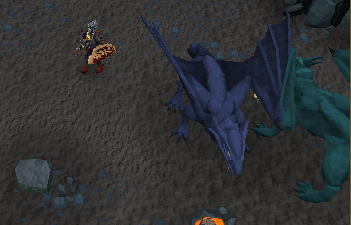 These dragons are not aggressive however. The Dragon Scales are often collected because they are used in Herblore to make Weapon Poison and Anti-Firebreath Potions. 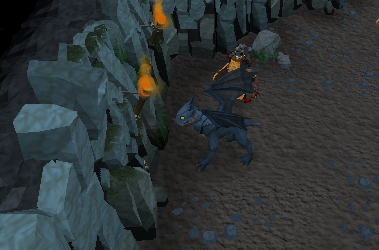 If you go all the way through the room and head South you will come to an area with 3 spawns of Baby Blue Dragons. These are killed because they give good Prayer experience when you bury the bones they drop. 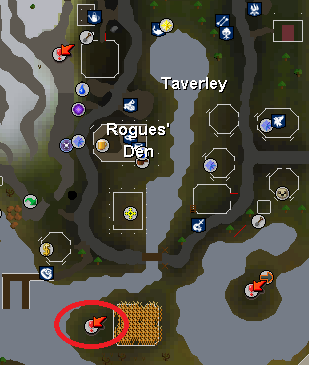 Next to these is the fishing spot used during the Heroes Quest to catch Lava Eels. To the West of this is a passage that will lead you to a room packed with Black Demons. They may be a high level and able to hit a lot of damage, but there are places in the North-West corner of the room that you can hide behind and Range them from. This is also a good place to use a Cannon. Heading out the North of this room to the East is the room where you will find one of the Scorpions during the Scorpion Catcher Quest. The area around here is also full of Poison Spiders that will poison you! There are two exits out the North of this room. 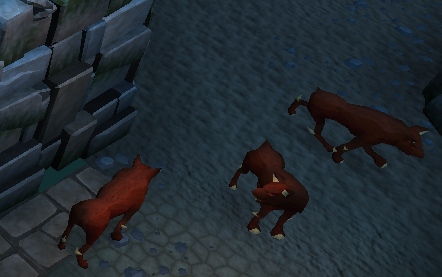 The one to the East leads to some Hellhounds which are killed for the level 3 Clue Scrolls that they drop. The one to the West leads to the home of the Black Dragons. They are level 144, but can be Ranged from a spot to the West. West of the Black Dragons is the Fire Obelisk which is used to charge Orbs to make them Fire Orbs and up the ladder in the South of the area with the Black Dragons is the Water Obelisk. This does the same job as a Fire Obelisk, but makes Water Orbs, not Fire ones. From here you can also see the Catherby shore. So there we have it. You have reached the end of the dungeon. You can either teleport out or walk back the way you came. Happy exploring! When you walk into the cave you will see about 5 level 22 Skeletons. 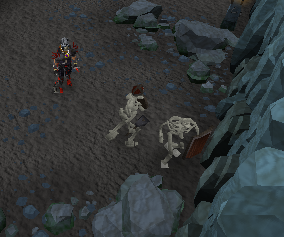 These skeletons can be killed by magic, melee or ranged. Skeletons drops herbs, bronze armor and weapons, iron weapons and armor, half key, air runes, rune javelins, and coins. If you are killing skeletons for a slayer task it gives 29 experience. 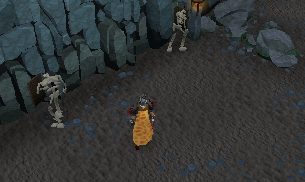 The level 46 skeletons can drop runes from airs to natures as well as iron and steel arrows. 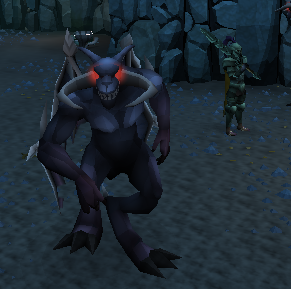 Surprisingly, when you get them for a slayer task, you will want to go with the level 22 skeleton as this one only gives 15 Slayer experience. Ghosts drop absolutely nothing! 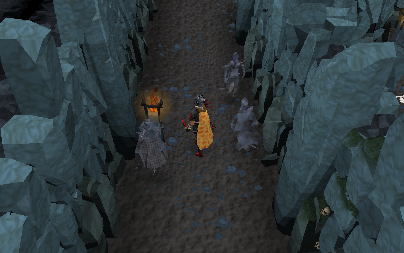 They give 25 Slayer experience if you get them for a task. 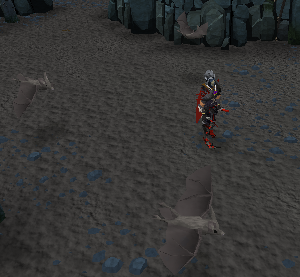 Bats only drop bat bones, batwing, and ocassionally charms. The best way to kill them is range. 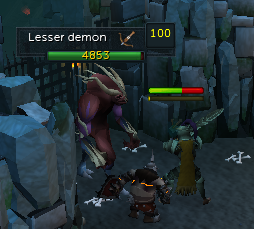 They give 32 slayer experience if you have them for a task. This guy drops Dragon Square Halves, various herbs, all kinds of runes, Chaos and Nature Talismans, Dragon and Rune Spears. They are best defeated using range attacks they are mage base. These aggressive, mystical flying hatchets are located off to the side, east of the Black Knights. This is a common place to kill them, and it is usually crowded. Make sure you have dragonfire protection! A summoning familiar may be helpful to hold more items to stay longer. 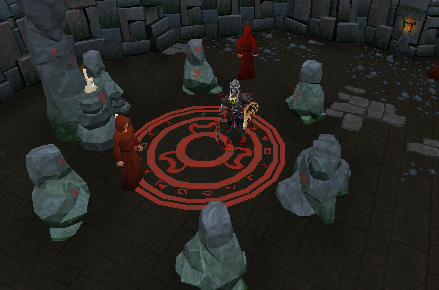 You can Lodestone teleport (Or house teleport if that's where your house is) to Taverly for banking.